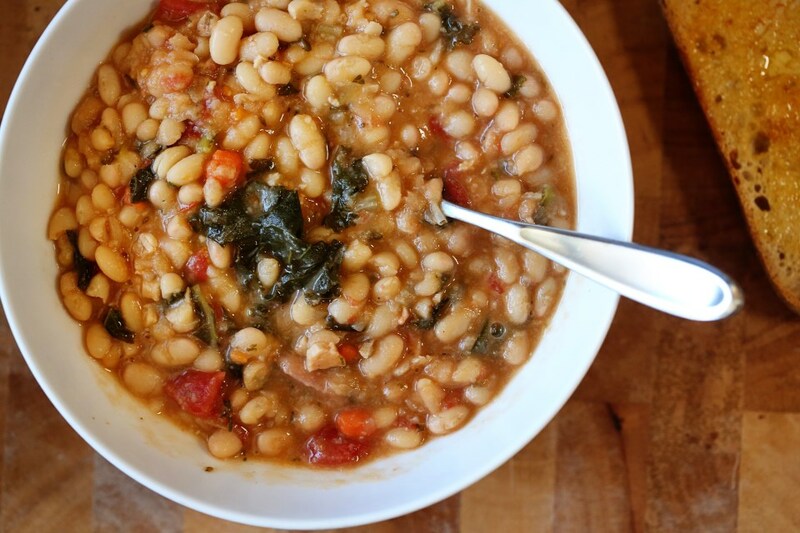 White Bean Stew with Smoked Sausage and Kale – Using Up Leftovers! So it seems winter is going to beat us down at least one more time before spring officially arrives. Maybe more, but I’m hoping for just one last hurrah. I used to love winter and all its coziness and hot tea and warm socks. But now that I’m a mother of two little people, I find winter to be quite suffocating. I just NEED there to be the option to go outside. When I had Ellie back in November, I quickly taught Ollie how to open the backyard door by herself. That was probably the best move I made all year. She could come and go while I fed the baby and everyone was happy. But when it snows, there’s this expectation from Ollie that we MUST GO OUTSIDE NOW AND YOU MUST GO WITH ME. And it just isn’t that easy. And frankly, as most of you know, it takes 15 minutes to get a child bundled up to go outside and then 5 minutes for them to get so cold they want to come back in. I fail to see how it’s worth the effort. The one thing I DO love about cold weather is the food. I love making a huge pot of beans and eating it over the following days in various ways. Over cornbread, with smoked sausage, in a quesadilla, with a fried egg, whatever, it’s all good. And this most recent batch of stew we made was my favorite. Because Matt made it. Seriously, though, we both make our beans in the same way and much in the spirit of the Family Meal Blog, I always love when a recipe is made by someone else in this family. This stew also does my most favorite thing in the entire kitchen-world: it uses up leftovers! We threw in a half used can of diced tomatoes, a handful of kale, onion, and some leftover turkey and sausage from a local bbq joint and it was frankly, amazing. 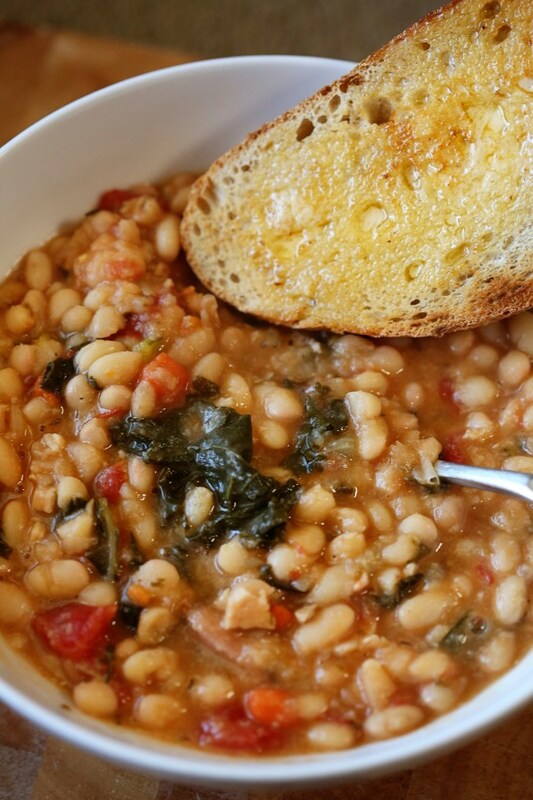 The beauty of a good bean stew is that you can add anything and if the beans are good, you’re good to go. For this, I recommend using dried beans instead of canned, although canned would cut the prep/cook time by a good 8 hours. They just don’t have the depth of flavor that starting with dried beans does. And because we’re a part of Rancho Gordo’s Bean of the Month Club, (yes) I recommend you get their beans if you can find them! *start this recipe the day before you want to eat it! Modified for a slow cooker below the recipe! The night before you want to eat this stew, rinse the beans and then submerge them in a large stockpot by about 2 inches of water along with the bay leaf. In the morning, bring the beans to a boil in the same water you soaked them in and add the onion, carrot and celery and garlic cloves. Season with salt and pepper. Reduce to an active simmer and cook until beans are tender. This time can really vary. I’d say on average, I have the beans simmering for about 2 hours before they are a texture I like. Some like al dente beans. I’m not one of those people. I also don’t like them to be total mush, like canned, but it’s your preference, really. Just start tasting them after an hour and keep going if you’re not satisfied. After about an hour of simmering, add in the tomatoes and meats (and honestly, the meats were leftovers in our fridge. You could add bacon, ground beef, no meat at all – this soup will be amazing no matter what). Toss the kale in about 30 minutes before serving and adjust the seasoning of the stew with extra salt and pepper. Remove the bay leaves and serve with crusty buttered bread. Slow Cooker Note: this could all be done in a slow cooker if you wanted to get it on before you go to work. Just soak the beans in a large slow cooker overnight with the bay leaves with at least 2-3 inches of water covering the beans. In the morning before you leave for work, add in the mire poix and garlic and turn it to low. When you get home, add in the rest of the ingredients and turn it on high for about 30 minutes to let it boil. Adjust the seasoning and serve. 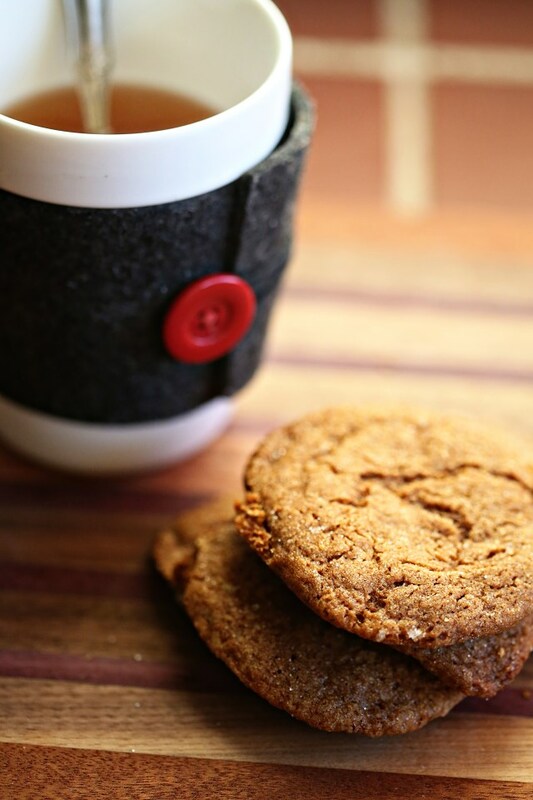 There will be two original ideas from these cookies coming to you in time for Valentine’s Day. The base recipe is from The New Best Recipe cookbook and like everything in that cookbook, it’s flawless. Enjoy and make sure you have a friend over to help you enjoy them. Adjust the oven rack to the middle position and heat the oven to 375 degrees. Line a large baking sheet with parchment paper or spray with nonstick spray. Whisk the flour, baking soda, spices, pepper, and salt in a medium bowl until thoroughly combined; set aside. 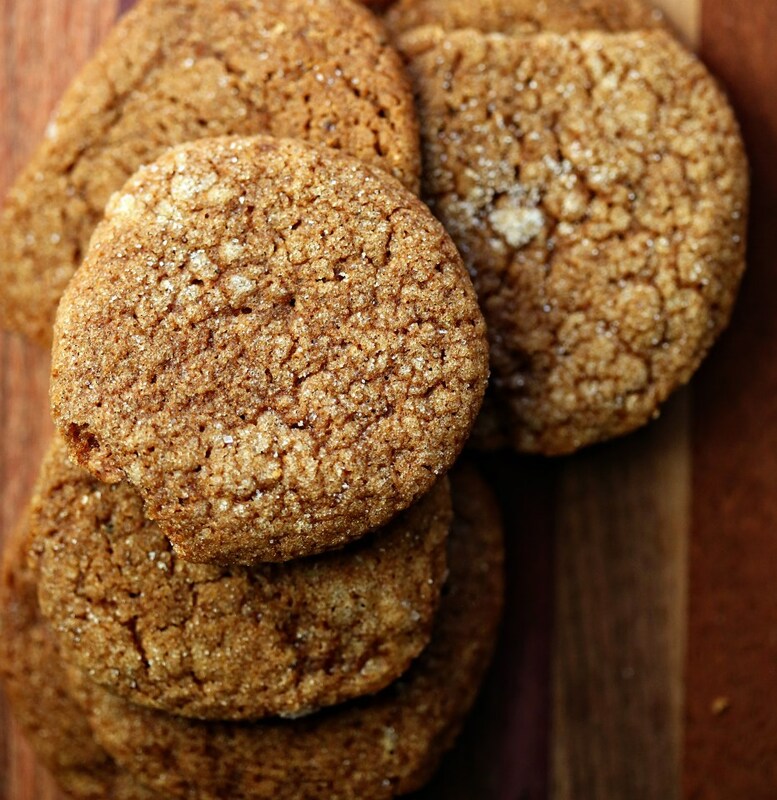 Beat the butter with the brown sugar and the 1/3 cup granulated sugar at medium-high until light and fluffy, about 3 minutes. Reduce the speed to medium-low and add the yolk and vanilla; increase the speed to medium and beat until incorporated, about 20 seconds. Reduce the speed to medium-low and add the molasses; beat until fully incorporated, about 20 seconds, scraping down the sides of the bowl as you go. Reduce the speed to the lowest setting and add the flour mixture and beat until just combined. The dough will be very soft. With a tablespoon measure, scoop out the dough and with wet hands, roll the dough into balls, then roll in the granulated sugar. Place on the baking sheet 2 inches apart. Bake until the cookies are browned and still puffy, the edges have begun to set, and the centers are still soft (the cookies will look raw between the cracks), about 11 minutes, rotating the sheet from front to back halfway through baking time. Don’t overbake! 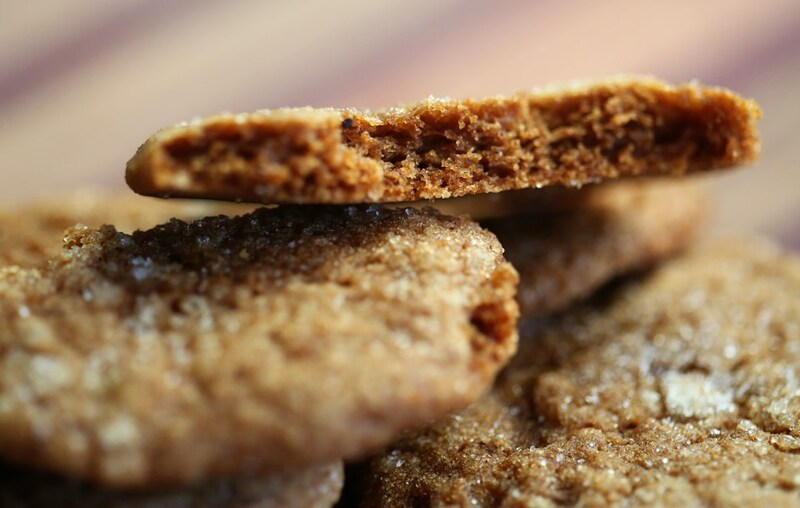 Cool the cookies on the baking sheet for 5 minutes, then let them cool on a wire rack to room temp. Eat post haste.